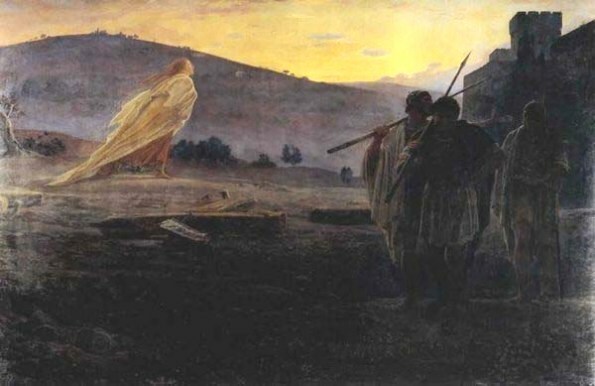 Artists struggle to portray the Resurrection. How do you show something that nobody saw, or could imagine? Or angels, who were symbols of communication between God and people? 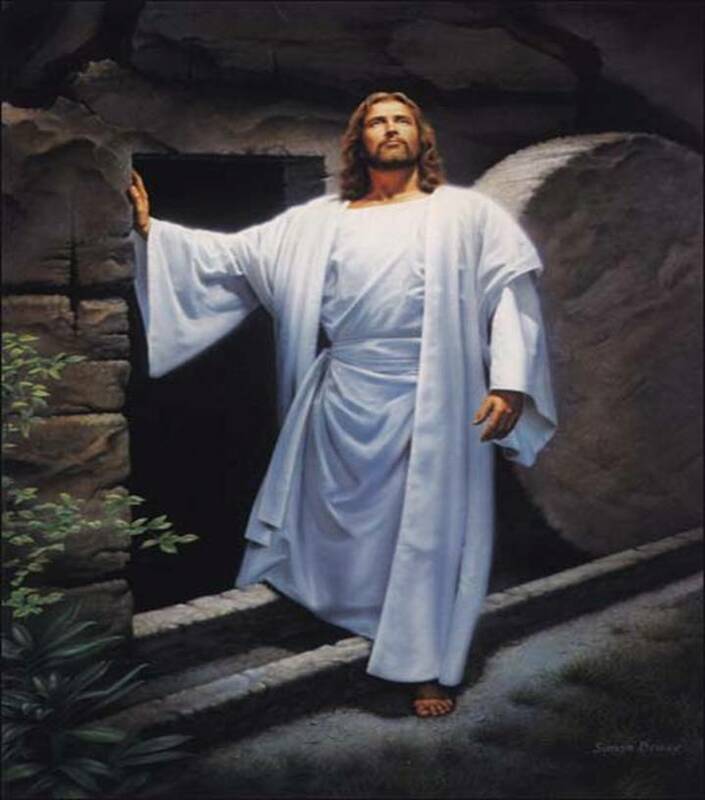 Or Jesus, who was dead but was now said to be living? Bramantino (circa 1465-1535) was a Lombard painter and architect whose real name was Bartolomeo Suardi. His works were noted for their fine architectural backgrounds – though there is little evidence of this in ‘The Resurrected Christ’. If anything, it is the face, body and cloak that have an architectural quality, evidence of careful draughtsmanship. Bramantino was trying to capture the image of a perfect man – perfect in form, in intellect, and compassion. 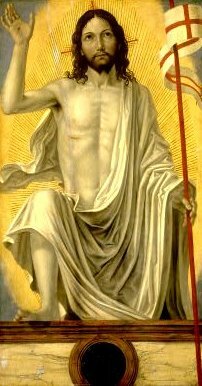 At the same time, his ‘Resurrected Christ’ is a man who has passed through death and is now detached, no longer part of the world that we, the living, inhabit. The cloak that Jesus wraps around himself has an almost metallic sheen to it, mirroring the pallor of the skin. And yet you notice that the face itself has quite a different colour to it, as if there is more life in it than there is in the body. The skin is luminously pale, unearthly, even though it shows the marks of violence and the raised veins of a living body. The eyes are sad, looking through and past the viewer. They are the eyes of someone who is somewhere else. These eyes have seen things the living have not seen. They are disquieting. Carl Bloch was a well-known and popular Danish artist in the 19th century. 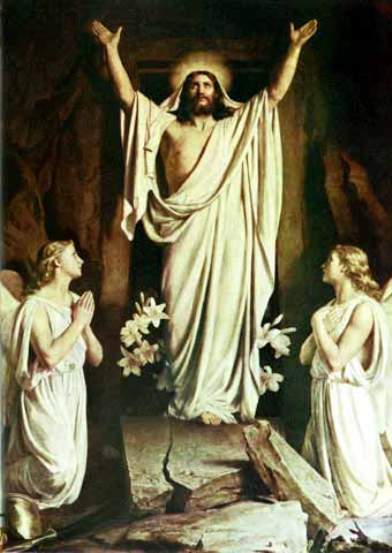 He painted a series of works on the Life of Christ, which are now housed in the Frederiksborg Palace, Denmark. His paintings would not please art aficionados today – the figures in them are too clean, calm and European. They do not express the gritty reality of Jesus’ life, but rather an ideal. This does not cater to the 21st century’s craving for historical reality. But the best of his pictures are quite beautiful, as this example shows. Gay/Ge was a brilliant thinker and painter who was, in his later paintings, out of step with his times. 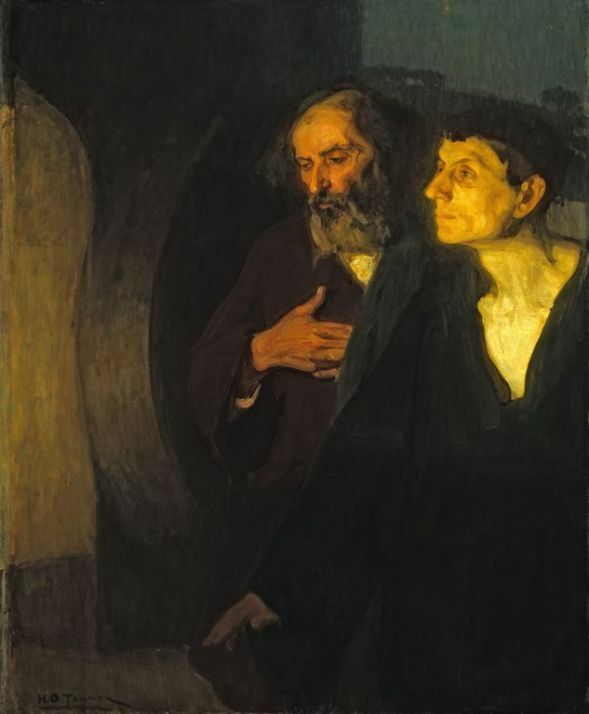 His first paintings were safe conventional scenes – ‘Solomon’s Judgement’ for example is indistinguishable from hundreds of other religious paintings being done at the time. As Gay aged, however, he began to produce works that were savage, distraught and deeply offensive to many people. 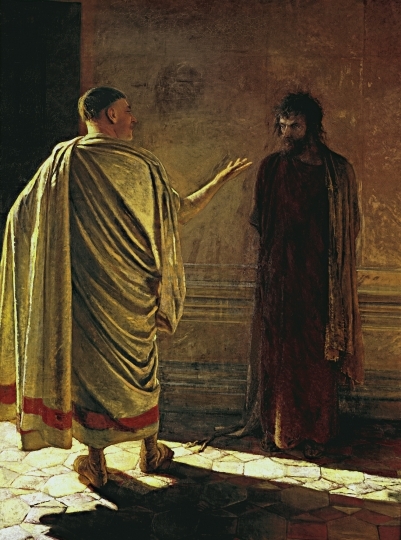 His ‘Christ and Pilate’ (1890) shown above was banned as blasphemous, and his ‘Crucifixion’ was more harrowing and realistic than people wanted to see. ‘Harbingers of the Resurrection’ is somewhere in between. Soldiers shrouded in darkness slink away from a discarded, broken cross; their purpose is done. The sky and the angel/Christ-figure both throb with life, but they fail to light up the faces of the soldiers or the dark fortress at the right of the picture. They are harbingers only, not the real thing – that is only just beginning. Serenity. Acceptance. Calm. A delicate naturalism. And a certain sadness. 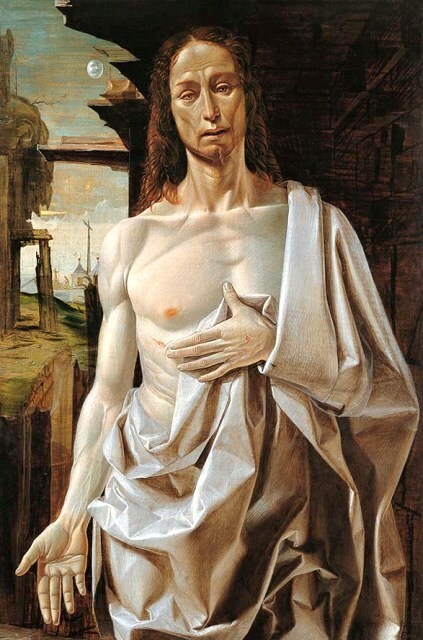 These were the qualities that Borgognone presented in his painting of the Risen Christ. The God/Man he shows is no longer troubled by the cares of his turbulent life. He has passed beyond this, into his glory.